To simply write Prog Metal today is a complex thing. We need to explain, to put more information for the public due the ample range of musical formats that Prog Metal has. And sometimes, we have to deal with boring bands that uses instrumental technique as a show of self-indulgence. But some are excellent due the creative insight they have. 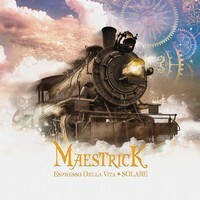 And that’s the case of MAESTRICK, band from São José de Rio Preto (São Paulo), who is releasing their second full length, “Espresso Della Vita: Solare”. Musically, they mix Progressive Rock and Heavy Metal essence in the same proportions, and using some influences from regional rhythms from Brazil (as we can hear clearly on “Rooster Race” due the use of caipira guitars) , and even from extreme Metal genres. To explain in a better way, their Progressive Rock side is influenced more by YES, GENESIS and JETHRO TULL than by PINK FLOYD, along some Pop Rock touches. So you have in hands a different band that demands of you sometime to understand. But when you get the idea, you’ll be caught! Adair Daufembach played all the guitars and produced the album, and he did a fine work, creating the perfect sound quality for them to express their musical ideas clearly, but with excellent instrumental tunes and that heavy atmosphere that they need, but everything sounds clean. And the artwork created by Juh Leidl is amazing, giving to the listener the right idea of the lyrical concept of the album. Yes, that’s it: “Espresso Della Vita: Solace” is a conceptual album, using the analogy of a train travel to fit into the daily experiences of us all. And the heavy and elegant way of “I a.m. Living” (excellent technical level, charming chorus and na amazing bass guitar and drums presence), the Brazilian regional touches and energy of “Rooster Race” (a straight and solid song, and a charming chorus is presented again), the “heavyssive” way of “Daily View” (excellent vocals parts and charming accessible melodies), “Keep Trying” and its great chords’ works, the long and multifaceted “The Seed” (that lasts more than 15 minutes, a true Heavy/Progressive voyage with excellent tempos’ changes), the aggressive and filled with Brazilian Groove on “Penitência” (with some Samba Rock influences), and the ethereal feeling of “Hijos de la Tierra”, are the best stations on this train voyage. But take advantage of all stops you can! All aboard, because the express train of “Espresso Dela Vita: Solace” is ready to leave, and MAESTRICK invites you all to be on special seats on it!